Harpsichordist Millicent Silver (1905-1986) was of the same generation as her more famous colleagues George Malcolm and Thurston Dart. As she recorded very little, and they recorded, by comparison, prolifically, Silver’s name has largely been kept alive through her many students and admirers. Spanning decades her eminent students numbered players such as Christopher Herrrick, Christopher Kite and Trevor Pinnock. From 1952 she played a full-sized double-manual wooden framed instrument made by Robert Goble of Oxford. The registers are controlled by pedals rather than handstops and its resonant sound is undeniable. She continued playing a wide range of repertoire, from Bach, Couperin and Rameau through the English virginalists to the music of Gordon Jacob, Walter Leigh and even Henze. 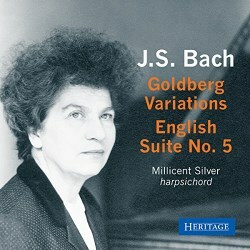 But the Goldberg Variations remained central to her repertoire and it’s fortunate that it’s one of the few works she recorded, which she did for the Classics Club label in a disc released in 1957. It was later reissued by Saga. No location is noted in the documentation, or indeed an exact year in which the recording was set down, but I’ve always understood it to have been made in her practice studio. She takes a few repeats but not many and her approach is largely, though not consistency, stately as regards tempo. The microphone is quite close to the instrument, as it had been for Landowska, which is sometimes a little uncomfortable. There are admirable things throughout and also rather fussy elements too. Her phrasing can be vertical, occasionally pugnacious, with small moments of startling articulation and dynamics used in constant contrast. The first variation is quite odd in these respects, the third exudes plenty of colour, the fifth is subject to changes of dynamics and the tenth somewhat stolid. The thirteenth variation speeds up and slows down, the fourteenth is quite bizarre in places, whilst the twentieth has odd voicings and busy articulation. One element of her playing is an almost alchemical excitability. This can lead to very excitable flurries in her playing – most obviously audible in variation 23. Her use of the bass register is sometimes challenging, but when she marries rhythmic vitality to fluidity of phrasing things go well. It’s a shame that the Arai da Capo sounds somewhat over-emphatic. The English Suite No 5 in E minor comes from another LP. Her playing here is the more cogent and architecturally sound. The concern for big dynamic gradients is still obvious but it’s accompanied by less in the way of arbitrary-sounding phrasing – albeit what may seem arbitrary-sounding to me was doubtless firmly conceived her Silver. At roughly the same time that she was recording the Variations, the émigré Scottish pianist James Friskin, husband of Rebecca Clarke, was doing the same in New York for Vanguard. His approach is much more aligned with modern approaches, Silver’s sounding craggy, idiosyncratic, unsettled, sometimes technically harried. And yet for all that there is something very intriguing about her playing. If Friskin and his contemporary Maurice Cole – whose Bach recordings should be reissued – come from a wholly different lineage to Silver, her unexpected cussedness strikes a most unalluring but highly personal stance. The booklet documentation is excellent and the transfer has done what it possibly can with the original, rather homespun recording. It seems a shame to end with a plea not related to Silver, but needs must: who is going to reissue George Malcolm’s superbly conceived recording of the Variations?